DJI, the world’s leader in civilian drones and aerial imaging technology, and Hasselblad, the leader in high-quality professional medium format cameras, Tuesday marked the start of the next era of aerial photography by introducing the first 100-megapixel integrated drone imaging platform. The DJI M600 Pro drone, the Ronin-MX gimbal and the Hasselblad H6D-100c camera combine each company’s unparalleled technological expertise to create an unprecedented tool for precise, detailed and accurate aerial imaging. Professional drone users can continuously control camera operations in flight using the DJI GO app, in order to provide rich imagery for landscape and fine-art photography, robust data for surveying and mapmaking, and endless possibilities for future professional endeavors. The flight platform for the combination is the DJI M600 Pro drone, an advanced and adaptable six-rotor flight platform equipped with the powerful Lightbridge 2 transmission system, a dustproof propulsion system and six Intelligent Flight Batteries. The M600 Pro can be guided by the D-RTK GNSS navigation system, which can withstand strong magnetic interference to provide highly precise centimeter-level 3D positioning. This enhanced accuracy over typical barometer, compass and GPS systems makes it ideal for exacting commercial, industrial and scientific applications. The Hasselblad H6D-100c camera is a triumph of camera technology, with a large 53.4 mm x 40.0 mm sensor that offers outstanding detail, color reproduction and tonal range even in poor lighting conditions using the HC and HCD lens family. The camera mounts on the drone through the Ronin-MX three-axis stabilized gimbal, which uses powerful motors and inertial measurement units to resist high G-forces, maintain stability and hold the horizon. The M600/Ronin-MX/H6D-100c platform is the latest product collaboration since DJI assumed a stake in Hasselblad in late 2015, allowing the companies to explore fruitful collaborations on their advanced technology. Their first joint product, released in July 2016, combined the M600 drone platform with the A5D medium format camera. Hasselblad remains the only medium format camera company collaborating with DJI to bring unprecedented quality to drone photography. 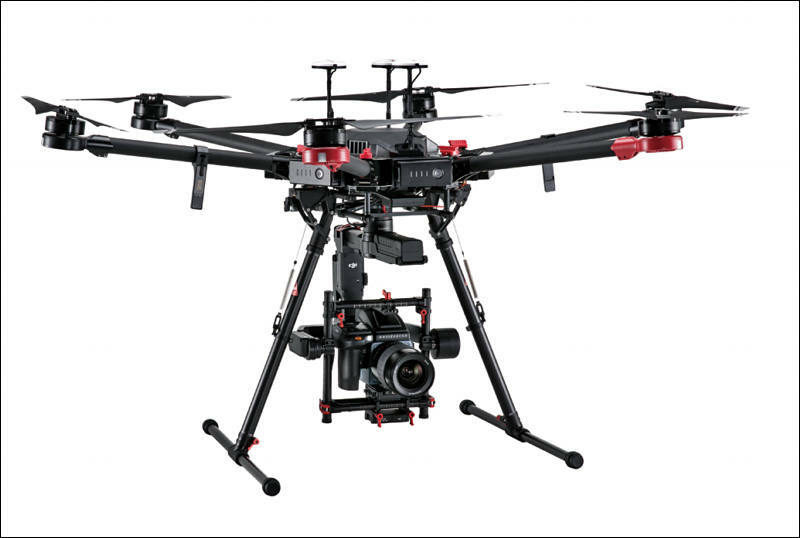 The M600/Ronin-MX/H6D-100c platform is on display through April 27 at the NAB Show in Las Vegas, Nevada, in DJI booth #C2807 in the Central Hall of the Las Vegas Convention Center. The combination will be released in the third quarter of 2017 at a price to be announced later.